The population was 80,405 at the 2010 census. The city's population was estimated at 84,067 as of July 2016 by the U.S. Census Bureau. Bloomington is the home to Indiana University Bloomington. Established in 1820, IU Bloomington has 49,695 students, as of September 2016, and is the original and largest campus of Indiana University. Most of the campus buildings are built of Indiana limestone. Bloomington has been designated a Tree City for 32 years, as of 2015[update]. The city was also the location of the Academy Award–winning 1979 movie Breaking Away, featuring a reenactment of Indiana University's annual Little 500 bicycle race. Monroe County's famous limestone quarries are also featured in the movie. The Elias Abel House, Blair-Dunning House, Bloomington City Hall, Bloomington West Side Historic District, Cantol Wax Company Building, Coca-Cola Bottling Plant, Cochran-Helton-Lindley House, Courthouse Square Historic District, Hinkle-Garton Farmstead, Home Laundry Company, Illinois Central Railroad Freight Depot, Johnson's Creamery, Legg House, Millen House, Millen-Chase-McCalla House, Monroe Carnegie Library, Monroe County Courthouse, Morgan House, J.L. Nichols House and Studio, North Washington Street Historic District, The Old Crescent, Princess Theatre, Prospect Hill Historic District, Second Baptist Church, Seminary Square Park, Steele Dunning Historic District, University Courts Historic District, Vinegar Hill Historic District, Wicks Building, Woolery Stone Company, and Andrew Wylie House are listed on the National Register of Historic Places. According to the 2010 census, Bloomington has a total area of 23.359 square miles (60.50 km2), of which 23.16 square miles (59.98 km2) (or 99.15%) is land and 0.199 square miles (0.52 km2) (or 0.85%) is water. Bloomington is an area of irregular limestone terrain characterized by sinks, ravines, fissures, underground streams, sinking streams, springs and caves. It is situated in the rolling hills of southern Indiana, resting on the intersection of the Norman Uplands and the Mitchell Plain. The relatively varied topography of the city provides a sharp contrast to the flatter terrain more typical of central to northern portions of Indiana. Bloomington is located on a comparatively high ground, the summit of the divide between the basins of the West Fork and East Fork of Indiana's White River. Accordingly, there are no major watercourses within the city, nor is much groundwater available for wells. The largest stream within the city itself is Clear Creek, with its eastern branch known on the Indiana University campus as Jordan River. Due to the absence of either natural lakes or rivers or groundwater in or near the city, a number of dams have been constructed on nearby creeks over the last 100 years to provide for the water needs of Bloomington and Monroe County. Early 20th-century damming projects occurred at a number of locations southwest of the city, the most notable of them being the Leonard Springs Dam. Due to the limestone formations underlying the reservoirs and the dams, water kept seeping from the reservoirs through naturally developing underground channels. Despite all efforts, the city was never able to fully stop the leakage, and had to resort to pumping leaking water back to the reservoir. By the 1920s, a more radical solution was needed to deal with the water crisis. A new reservoir, known as Griffy Lake, was constructed in a more geologically suitable area north of the city. (It is now within Bloomington's official city limits.) Later, in the 1950s, two much larger reservoirs, Lake Lemon and Lake Monroe were created in the northeastern and southeastern parts of Monroe County. Monroe Lake was created by the US Army Corps of Engineers for flood control, but has since been used to supply the city and the county with water. The water pumping station at Griffy Lake has been mothballed. PCB pollution, associated with Westinghouse's operations, long was a concern in the area. A number of sites, in particular, Bennett's Dump and Lemon Lane Landfill at the northwestern edge of the city and Neal's Landfill in the county, were listed as Superfund sites. Clean-up operations at the Bennett Quarry site, started in 1983, were largely completed by 2000., while cleanups at the other sites were completed in 2012. 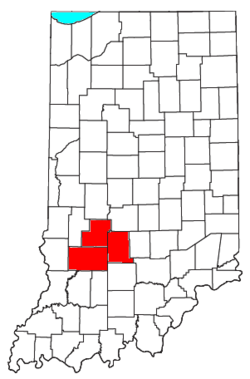 Bloomington is the principal city of the Bloomington Metropolitan Statistical Area, a metropolitan area that covers Greene, Monroe, and Owen counties and had a combined population of 175,506 at the 2000 census. As of the 2010 census, there were 80,405 people, 31,425 households, and 11,267 families residing in the city. The population density was 3,471.7 inhabitants per square mile (1,340.4/km2). There were 33,239 housing units at an average density of 1,435.2 per square mile (554.1/km2). The racial makeup of the city was 83.0% White, 4.6% African American, 0.3% Native American, 8.0% Asian, 0.1% Pacific Islander, 1.2% from other races, and 3.0% from two or more races. Hispanic or Latino of any race were 3.5% of the population. As of the census of 2000, there were 69,291 people, 26,468 households, and 10,454 families residing in the city. The population density was 3,511.1 people per square mile (1,356.0/km²). There were 28,400 housing units at an average density of 1,439.1 per square mile (555.8/km²). The racial makeup of the city was 87.03% White, 4.24% African American, 0.29% Native American, 5.26% Asian, 0.07% Pacific Islander, 1.10% from other races, and 2.01% from two or more races. Hispanic or Latino of any race were 2.49% of the population. 22.9% were of German, 10.2% Irish, 9.1% English and 8.4% American ancestry according to Census 2000. 89.3% spoke English, 2.9% Spanish, 1.3% Korean, 1.1% German and 1.0% Chinese or Mandarin as their first language. The Bloomington and Monroe County region is home to major employers representing a diverse collection of fields, including education, the life sciences, advanced manufacturing and technology. Bloomington is a regional economic center anchored by Indiana University and home to a diverse business community involved in pharmaceuticals, medical devices, technology, health care, and the arts. Bloomington's concentration of employment in the life sciences is six times greater than the U.S. average, and employment in the technology sector has grown by over 80 percent in recent years. Companies based in Bloomington include Cook Group, Author Solutions, OneWorld Enterprises, BloomingFoods and Singota Solutions. Bloomington has a public library, a branch of the Monroe County Public Library. A five-channel public-access television station is housed in the Monroe County Public Library. The station, known as Community Access Television Services or CATS, was established in 1973 and serves as a "dedicated constitutional forum." In April 1995, Rox, a program produced at CATS (then Bloomington Community Access Television), became the first TV series distributed via the web, with an episode titled "Global Village Idiots." Bloomington is a gold-rated bicycle-friendly community by the League of American Bicyclists. Bloomington and Indiana University currently run a dockless bikeshare program called Pace, launched in June 2018. ^ a b c "Feature ID 431207". Geographic Names Information System. United States Geological Survey. Retrieved June 30, 2014. ^ Monroe County History Center. "A Short History of Bloomington & Monroe County". City of Bloomington, Indiana. Retrieved July 6, 2017. ^ Staff. "Blooming Census Data". City of Bloomington, Indiana. Archived from the original on August 25, 2012. Retrieved October 15, 2011. ^ "Quickfacts: Bloomington city, Indiana". U.S. Census Bureau. Retrieved November 7, 2016. ^ "Indiana University Bloomington: About". Indiana University Bloomington. Retrieved July 13, 2017. ^ "2015 Tree City USA Communities in Indiana". Arbor Day Foundation. Retrieved November 7, 2016. ^ "2013 Tree Cities USA Communities in Indiana". Arbor Day Foundation. Retrieved September 7, 2014. ^ History of Lawrence and Monroe Counties, Indiana: Their People, Industries, and Institutions. B.F. Bowen. 1914. p. 435. ^ "Monroe County". Jim Forte Postal History. Retrieved September 5, 2015. ^ Blanchard, Charles (1884). Counties of Morgan, Monroe and Brown, Indiana: Historical and Biographical. F.A. Battey & Company. p. 463. ^ "National Register of Historic Places Listings". Weekly List of Actions Taken on Properties: 3/24/14 through 3/28/14. National Park Service. April 4, 2014. ^ "Weatherbase: Historical Weather for Bloomington – Indiana University, Indiana, United States of America – Travel, Vacation and Reference Information". Canty and Associates LLC. October 2011. ^ "PCBs: Toxic Chemical Waste A Tragic Legacy For Ind. Town". The News and Courier. October 20, 1985. ^ "PCBs". in.gov. Archived from the original on February 2, 2015. Retrieved February 18, 2015. ^ "Superfund Information Systems Home - US EPA". epa.gov. Archived from the original on October 14, 2013. Retrieved February 18, 2015. ^ "Local Businesses". Archived from the original on March 26, 2013. Retrieved March 19, 2013. ^ "Facts & Figures". Archived from the original on October 15, 2012. Retrieved March 19, 2013. ^ "Hours & Locations". Monroe County Public Library. Retrieved March 10, 2018. ^ Quittner, Josh (May 1, 1995). "Radio Free Cyberspace". Time. ^ "Biking in Bloomington". City of Bloomington. Retrieved January 30, 2018. ^ "Five Things You Need To Know About Bloomington's New Bike Share". Indiana Public Media. Retrieved January 10, 2019. Wikimedia Commons has media related to Bloomington, Indiana. Wikivoyage has a travel guide for Bloomington, Indiana. Chisholm, Hugh, ed. (1911). "Bloomington" . Encyclopædia Britannica. 4 (11th ed.). Cambridge University Press. pp. 86–87.